The potential of software applications to solve an array of office and administrative problems is increasing faster than the ability of users to exploit it. We need to make systems easier to learn and more comfortable to use. This book reports a major advance in the effort to accomplish both goals. Flexcel enables users to modify access and dialog dynamics to their specific requirements. Relying on a plan recognition feature, the system proposes adaptations or uses of adaptations. The ongoing conflict between the adaptive and the adaptable is resolved in an integration: user and system share the responsibility for the initiatives, decision-making and execution. A ""critic"" component of the system then analyzes the user's handling of the adaptation tools and suggests improvements. The system offers an environment in which users can explore as they learn. HyPlan implements the context-sensitive help that facilitates learning on demand. When the PLANET plan-recognition feature identifies the kinds of support for work that may possibly be required, HyPlan provides, on request, specific assistance in the form of hypermedia or animated displays and tutorials. Developmental research has shown that users take advantage of opportunities to adapt interfaces only in conjunction with help-functions -- which are accepted when they do not interrupt work. And studies by social scientists have shown that adaptations of technical systems have to be integrated into the overall process of organizational innovation and undertaken cooperatively. 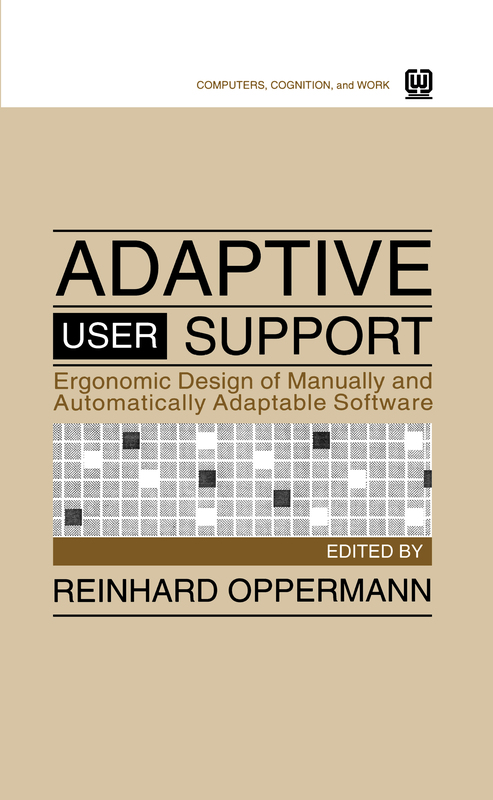 This book will stimulate all those concerned with software -- from computational, cognitive, ergonomic, or organizational standpoints -- to reconceive the relationship between design and user support.